The Meadows Museum at SMU in Dallas and the Museo Nacional del Prado in Madrid have announced a new pre-doctoral fellowship, part of the unique international partnership that unites these two leading museums. A grant from the Center for Spain in America (CSA) supports now the pre-doctoral Meadows/Prado Fellowship, designed to provide students with an intensive scholarly, professional, and international experience in curatorial work. The fellowships are an annual exchange with one appointment made by each institution. The CSA and its Spanish counterpart, the CEEH, have collaborated with the Meadows Museum on several projects prior to this announcement, including the exhibition and catalogue for The Lost Manuscripts from the Sistine Chapel: An Epic Journey from Rome to Toledo (2011); the exhibition and catalogue for The Spanish Gesture: Drawings From Murillo to Goya in the Hamburger Kunsthalle (2014); Sorolla in America: Friends and Patrons (2015); and the exhibition catalogue Zurbarán: Jacob and His Twelve Sons, Paintings from Auckland Castle (2017). This entry was posted in Fellowship, Uncategorized and tagged CEEH, CSA, Fellowship, Meadows Museum, Museo del Prado, pre-dcotoral, Spain, usa on February 22, 2018 by costanzabeltrami. In collaboration with the Meadows Museum, Dallas, Texas, and The Auckland Project, County Durham, England, The Frick Collection is organising an exhibition of Jacob and His Twelve Sons, an ambitious series of thirteen paintings that depict life-size figures from the Old Testament. On loan from Auckland Castle, the works by the Spanish Golden Age master Francisco de Zurbarán (1598–1664) have never before traveled to the United States. Now on view in Dallas through January 7, 2018, Jacob and His Twelve Sons will be shown at The Frick Collection from January 31 through April 22, 2018. In preparation for this unprecedented American tour, these important seventeenth-century Spanish paintings, dating from the 1640s, have undergone a year-long in-depth technical analysis in the conservation department at the Kimbell Art Museum, Fort Worth, the most extensive study of the series to date. For its New York showing in 2018, the exhibition will be coordinated by The Frick Collection’s Senior Curator, Susan Grace Galassi. This entry was posted in Exhibition, Uncategorized and tagged Auckland Castle, Bishop Auckland, golden age, New York, Spain, susan galassi, the auckland project, The Frick Collection, usa, Zurbarán on January 31, 2018 by costanzabeltrami. Oil on canvas, 27 x 51 ¼ in. (68.6 x 130.2 cm). Meadows Museum, SMU, Dallas. The Southern Methodist University’s Website announced today that The Meadows Museum has acquired Beach at Portici, the last painting of famed Spanish artist Mariano Fortuny y Marsal (1838-1874). This large-scale, unfinished work depicts the carefree atmosphere of a bbeautiful summer day at the beach, demonstrating Fortuny’s hallmark ability to capture light in paint. Fortuny was an especially popular artist with 19th-century American collectors and audiences, as revealed by the American provenance of this work. Indeed, it was featured prominently in the American Pavilion’s “Loan Collection of Foreign Masterpieces Owned in the United States” at the 1893 World’s Columbian Exposition in Chicago, one of the most important international exhibitions of the 19th century. Beach at Portici will be on view at the Meadows Museum beginning January 19, 2018. From June 24 through September 23, it will be the subject of a focused exhibition, At the Beach: Mariano Fortuny y Marsal and William Merritt Chase. This entry was posted in News, Uncategorized and tagged 19th century, america, Exhibition, forthcoming, landscape, mariano fortuny, new acquisition, SMU, Southern Methodist University, Spain, The Meadows Museum, usa on January 19, 2018 by costanzabeltrami. 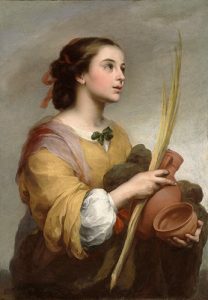 December of 2017 will witness the 400th birthday of Bartolomé Esteban Murillo (1617–1682), one of the outstanding painters of Golden Age Seville. The Meadows Museum, which holds more paintings by the artist than any other collection in the United States, will celebrate his anniversary with a special exhibition. The display will celebrate the Meadows’ extraordinary holdings of artworks by the artist, and pair them with paintings by Murillo’s Sevillian contemporaries, thus highlighting the artistic context with which he remains so intimately associated. Click here for more information on this exhibition. This entry was posted in Exhibition, Uncategorized and tagged anniversary, Dallas, golden age, meadows, Murillo, opening soon, Seville, usa on December 6, 2017 by costanzabeltrami. ©Max Aguilera-Hellweg, El Trabajador, Ciudad Acuña, Mexico, The Border, July 1989. This conference brings together scholars, curators, filmmakers, writers, and post-graduate students from Latin America and the Caribbean, the United States, Europe, and the UK. It stems from the ongoing collaboration between members of staff from the programmes of Spanish, Portuguese and Latin American Studies at Birkbeck, University of London, UK and the Department of Hispanic Languages and Literatures, at the University of Pittsburgh, USA. The processes we associate with contemporary forms of ‘globalization’ have – be they economic, political or cultural –spawned a variety of re-worldings that, via a number of transdisciplinary formations, have reconfigured the humanities, including Hispanism and Latin-Americanism, Cultural Studies, Postmodernism, Post-colonialism and even Post-structuralism being the most well-known. After the financial crisis, new (and not so new) trans, de-, and/or non-national or regional objects, subjects and assemblages are coming to the fore, redrawing and digitalizing established frontiers and differences as well as re-defining the politics of culture and its study. Before our very eyes, the transversal routes of migration world-wide are breaking down established frontiers, both in the old metropoli and in the so-called peripheries, at whose sites new cultural and political subjects are emerging. In the light of this global expansion of neoliberalism and new forms of governmentality, as well as the histories globalization brings into view, what are the concerns that are or should define the research agenda of a newly globalized Hispanism? In this conference, we revisit Luso-Hispanic and Latin@-American geographies, and reconsider the subjectivities emerging out of the above mentioned processes, in their varying conditions and trajectories, and also by way of the items in the material culture that conspire in their fashioning. This conference is generously supported by The Birkbeck Institute for the Humanities (BIH) and the Centre for Iberian and Latin American Visual Studies (CILAVS), both at Birkbeck, University of London. The Instituto Cervantes has also provided support for this event. In collaboration with Canning House and the Centre for Iberian and Latin American Visual Studies (CILAVS), a conversation between Ticio Escobar and John Kraniauskas will be hosted on Thursday 23 November 2017. Further information TBA. *Please note that Ticio Escobar’s paper ‘La crítica cultural como posición de frontera, contemporaneidad y diferencia’ will be presented in Spanish. *Please note this panel will continue at Birkbeck Cinema after the break. The Birkbeck Cinema is in 43 Gordon Square, London WC1H 0PD. Film Screening*: Spell Reel, 2017. Germany/Portugal/France/Guinea-Bissau. Directed by Filipa César. In Portuguese, Fula, Guinea-Bissau Creole, English, French; English subtitles. 96 min. *To be screened with the presence of filmmaker Filipa César. Spell Reel is the result of a multifaceted research and digitisation project that she initiated in 2011 with Sana na N’Hada and Flora Gomes. Having studied film in Cuba, the two began using the camera to observe the fight for independence in Guinea-Bissau (1963–74). After the decaying visual and audio material was digitised in Berlin, the filmmakers travelled with a mobile cinema to the places where the footage had originally been shot and showed it to audiences for the first time, adding their own commentary. They then moved on, also returning to Berlin. Spell Reel watches an archive at work to produce the present. This entry was posted in Conference, Uncategorized and tagged Birkbeck, Birkbeck Institute for the Humanities, Canning House, Caribbean, Centre for Iberian & Latin American Visual Studies at Birkbeck, Centre for Iberian and Latin American Visual Studies (CILAVS), Department of Hispanic Languages and Literatures, europe, geography, global, globalisation, Hispanism, Instituto Cervantes, international conference, John Kraniauskas, Latin America, latin-americanism, luso-hispanic, metropoli, migration, periphery, post colonialism, postmodernism, Ticio Escobar, UK, University of Pittsburgh, usa on November 5, 2017 by costanzabeltrami. This focused exhibition of paintings is inspired by a work in the Meadows Museum’s collection, Picasso’s Still Life in a Landscape (1915). In the early 20th century, Picasso and the Mexican artist Diego Rivera both lived and worked in Paris. Initially friends, in 1915 they fell out because Diego Rivera accused Picasso of plagiarising the foliage from one of his own paintings. The source of Rivera’s ire was the perceived semblance between his 1915 Zapatista Landscape (The Guerrilla) and Picasso’s Seated Man (1915-16), which in its first iteration – as seen by Rivera in another visit to Picasso’s studio in August 1915 – was known as Man Seated in Shrubbery. Rivera noted acute similarities between his canvas and that of the early state of Picasso’s work; namely, both works featured a similarly structured still life set outdoors. The Mexican artist’s very specific complaint was his former mentor’s liberal borrowing of Rivera’s formulaic foliage – scumbled patches of green and white paint on a dark ground. Picasso/Rivera: Still Life and the Precedence of Form takes as its point of departure another case study of the two artists’ works: Picasso’s Still Life in a Landscape (1915) at the Meadows, which will be displayed for the first time with Rivera’s Still Life with Gray Bowl (Lyndon Baines Johnson Presidential Library, Austin), painted in the same year. Exhibited in close proximity, these two paintings together encapsulate the two artists’ overlapping of themes and motif appropriation during that period. Picasso/Rivera: Still Life and the Precedence of Form affords a closer look at the development of Picasso’s Still Life in a Landscape in the Meadows collection by presenting it together with its analogue from the Columbus Museum of Art as well as Rivera’s variation on the theme from Austin. The visual dialogue taking place in 1915 between these two giants of modern art will be further outlined through the display of Rivera’s 1915 Still Life with Bread Knife, a second generous loan from the Columbus Museum of Art. Beyond the rich anecdotes regarding the relationship of the two artists, this group of paintings provides an opportunity to find parallels as well as deviations between these canvases. In spite of limited wartime resources, 1914-15 proved to be a fecund era of creativity for both Picasso and Rivera. This entry was posted in Exhibition, Uncategorized and tagged 1915, 1916, 20th century, Austin, Columbus Museum of Art, creativity, cubism, Dallas, Diego Rivera, featured exhibition, first world war, foliage, landscape, Lyndon Baines Johnson Presidential Library, Meadows Museum, Paris, Picasso, plagiarism, still life, texas, usa on September 8, 2017 by costanzabeltrami.